This week in Your Parents Basement, we’re loading up our PP7s, avoiding the Klobb at all costs and exposing double agents! 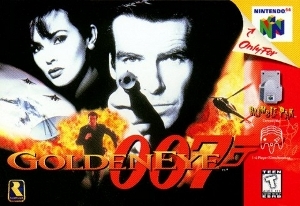 From 1997, we’re playing Goldeneye for the Nintendo 64, in honor of Spectre coming out later this week. You can manually download this week’s smooth and suave podcast here or subscribe to the show via the iTunes store. To manually subscribe, use this link in the device / podcast player of choice. You can also follow us on Twitter, or ‘like’ us on Facebook. 0:00 – Intro, which is from the Archives stage. 33:00 – We read letters and comments from readers on Goldeneye! 50:30 – Emails. The best games from 27 years ago, and the best vehicles in video games. 1:06:00 – Snifferoo. Standing by to play next week’s game! Who wants some??? – According to Price Charting, loose carts of Goldeneye go for around $11, with the complete box and manual collections going for $22 to $45. Sealed new copies go for $60 to $150. And hey, if you’re going to buy anything Goldeneye related, buy a pal and buy from Amazon via our link. – The good Guardian article on Rare’s making of the game is readable here, including some of the weird changes Nintendo and Miyamoto pitched.